Football Helmets and Fall Fishes . . . The night game of summer has moved on to new rules played in the daylight. 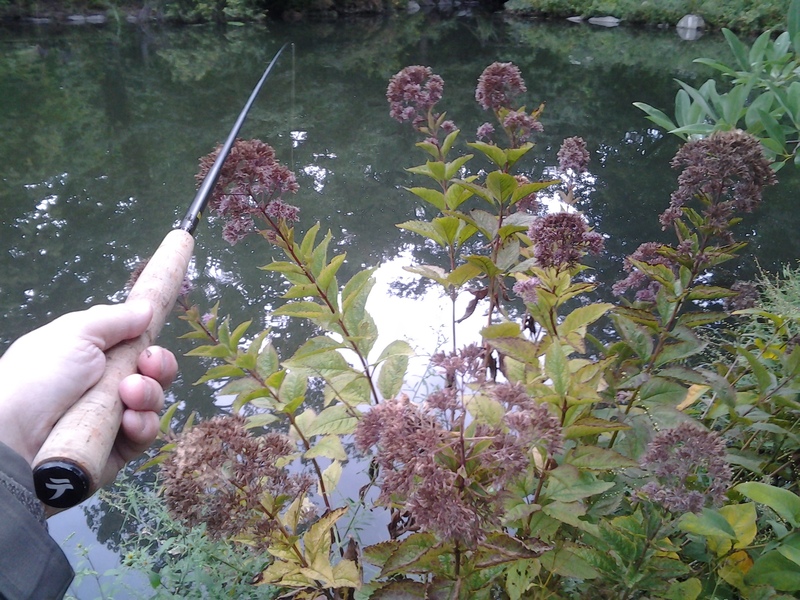 Rain may pass through, and the reopening of the sky brings good time to go outside and fish. When the dark does descend, quickly and almost cold, home calls as the nostalgia door opens to college year memories or past seasons, some of national championship caliber. Part of my own continued education in life experience has been set amidst a geography where home waters caress manes of watercress. There trout abound. Other neighbors on the stream, offered perhaps a polite wave from a fly fishing undergraduate, have included names of Harvey, Humphreys, and Meck and a Gordon, too, among many others; my constant sense of the eastern provincial in America stays connected, centered on a Pennsylvania county as well as five boroughs of New York City. Neighbors of the urban angle abound also and some distant shores have been or shall be explored alone and together with even more others. Before such diversions, the sharpened focus on a single bass, any bass, remains first in line. Bass season is again back in session. Temperatures drop to fifties and sixties Fahrenheit. Sunlight remains bright, often unfiltered, but days of rippled gray skies do pass. Rain remains brief unless it’s a hurricane trailing through for four to five days. Ponds again begin to clear and darken. A frosting of bright duckweed foots cattails and pickerel weed. Slow presentation with a long horizontal reach, a natural fishing problem for tenkara to tackle and bring to quick resolve, can take a kebari to the bass level (a multifaceted pun too compelling not to intend). The largemouth and smallmouth bass alike, after striking your pattern in a singular fashion near the water column’s bottom, bring fast reactions to the top. This athleticism has had a portion of its antecedence come from the fish’s own daily hunting. Black and blue damselflies, measured in inches, still pass time in the air. Nymphs that resemble such varieties in various stages of development swim and crawl throughout a still water. Bluegill fry swim in small schools, too. Bass can be lured when these larger naturals are mimicked by an equal kebari tied to a generous tippet matched with a Level Line or a Traditional Tapered. A largemouth, hooked on such a kebari of size 8 or 10, may jump three times and roll on each leap skyward. Size varies by location. Any fish that is perhaps best sized to a September zucchini may be noteworthy to big fish fans. 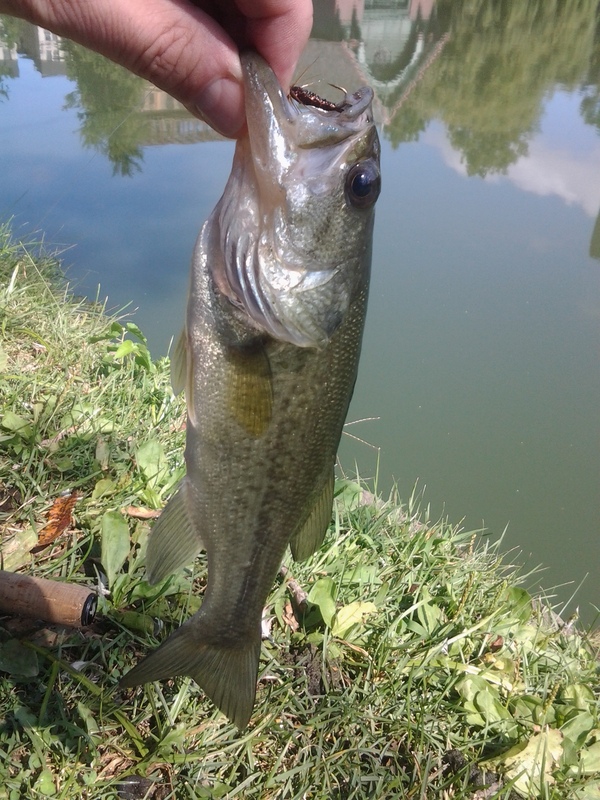 Smaller fish – dill pickle bass and slab bluegill – still insist on being counted. Vigorous takes by a quarter pound fish inhales the pattern deep in the mouth, doubles the perceived strength of pull during breaking sprints, which brings added utility to the longer tippet with its greater capability for stretch. Be mindful to bring clamps with a few inches of reach. 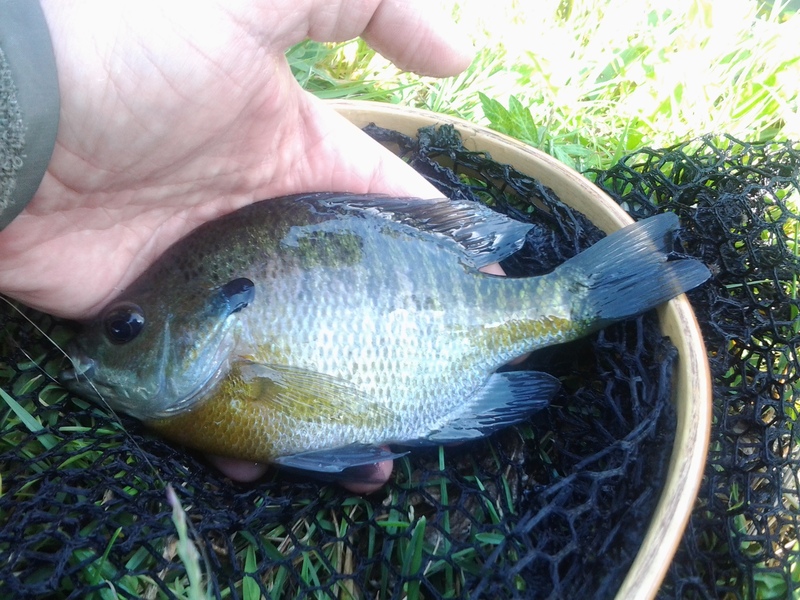 To release a bluegill hooked so deeply, first fold the fish’s spiny dorsal fin down with the inside of your wet fingers, grip the fly with the teeth of the clamp, twist as far as necessary as a slight downward push on the pattern is made. This most often dislodges the hook with minimal penetration of the fish’s interior. Most small fish will thrust voluntarily from hands placed low over the water and depart with a resounding and reassuring splash. A net facilitates the unhooking of an autumn bright bluegill. Orange Jewelweed and pale purple clusters of New York Ironweed border many New York stillwaters by late September. The green of leaves has acquired a more yellow cast. Some bluegills exhibit similar rusted or buttered bellies below strong barred sides. The bass remain silvered and green with a distinct black lateral band. Colored patterns all that would fit on a football helmet with ease. Great blog! Excited to learn how to Tenkara. 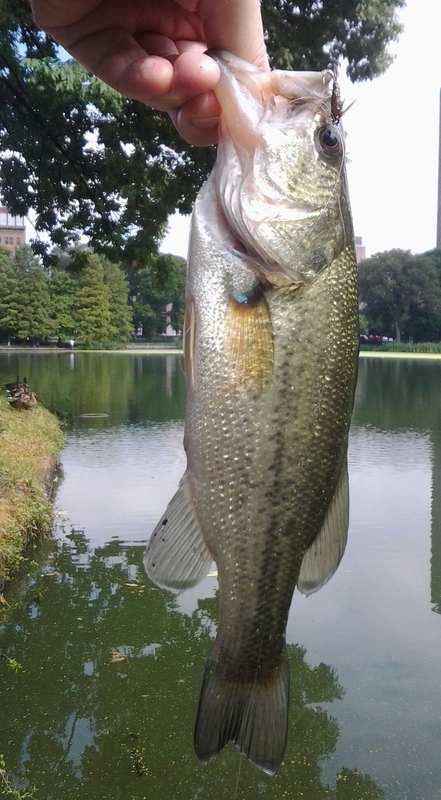 Haven’t really fished since moving to NYC, curious on where one fishes in urban jungle. I know people guard their spots so any tips on locations in Manhattan and not the outer boroughs?